Q Acoustics 3050i 5.1 Cinema Pack review | What Hi-Fi? You only have to take a look at the divorce statistics to know there’s no guarantee that any coupling will go to plan, no matter how well intentioned. So even though we adored both Q Acoustics’ 3050i floorstanders and its 3010i 5.1 Cinema Pack, we are still taken aback by how exceptionally they complement one another in practice. The 3050i 5.1 speaker system is essentially the same as the 3010i, only with a pair of Q Acoustics’ brilliant floorstanders swapped in for the front channels. Those speakers haven’t undergone a massive change since the 3050s – outwardly the only noticeable difference is the addition of a fourth colour finish (now grey, walnut, white or black) and a chrome bezel around each driver. But this is no mere cosmetic revamp. As with the 3010i and 3020i, cabinet rigidity has been improved – P2P (point-to-point) cabinet bracing gives extra support to the parts that require stiffening to make them quieter; the baffle is thicker to better support the tweeter and mid/bass driver; and the traditional terminal panel cut-outs make way for embedded sockets within the cabinet. The 3050is’ 20mm soft dome tweeter has been decoupled from the baffle via a suspension system to isolate it from vibrations from the two sandwiching 16.5cm woofers. Unique to the 3050is in the range, however, is Q Acoustics’ use of HPE (Helmholtz Pressure Equalizer) technology, which the company introduced in its high-end Concept 500 speakers and has since trickled down to this lower price point. Essentially, it’s a tube filled with damping material inside the cabinet, which aims to absorb unwanted energy and reduce resonance. The 3010is, which make up the surround channels, are 25 per cent larger by volume than their predecessors, and also benefit from much of the evolution seen in their floorstanding siblings. Being a fair amount smaller, however, their mid/bass driver measures 10cm rather than the 3050i’s 16.5cm. We’d defy anybody not to enjoy an evening spent with this speaker package. Their energy and exuberance is infectious, without being fatiguing, and those qualities are complemented by a great deal of maturity and insight too. The power and bass weight offered by the 3050i caters for greater intensity, without forgoing the snappy timing of their more diminutive partners. That fluidity and fleet footedness is one of the most impressive aspects of this package, avoiding rigidity for a fast but natural sounding performance. Any home cinema package lives or dies by its centre speaker, where so much of the dialogue is delivered, and, paired with the 3050i, the same speaker seems to perform even better in this set. Here, it seems even more dynamic and engaging than when partnered with the 3010i fronts, and knits seamlessly with its new surroundings. The sub’s output is augmented by the 3050is taking on part responsibility for bass power, which means plenty of extra low-end detail. Insight generally is better too, especially with soundtracks, where the 3050is pick out extra strands and organise them with the same precision we heard when testing them as a stereo pair. Their general musicality doesn’t go unnoticed in that regard either, with subtle and large-scale dynamics delivered with confidence and deft understanding. To put this 5.1 Cinema Pack’s brilliance into context, we believe you’d have to spend twice the amount – for example, on Monitor Audio’s Silver 200 AV12 package – to experience an immediately noticeable upgrade in performance. Considering its nearest rival at the other end of the spectrum ­– the 3010i Cinema Pack we gave a glowing review last month – is only £500 cheaper, that’s a lot of competition for this package to fight off. It is worth stressing just how talented the 3050i 5.1 Cinema Pack is. It’s an instant hit, easily identifiable within moments of it being switched on. 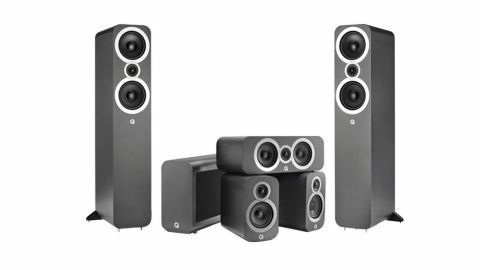 If you’re looking for a floorstanding speaker package to elevate your home cinema for less than two grand, you should consider this set of Q Acoustics.